Long-billed Vulture is the smallest of the vultures. Adult has pale plumage on body and upperwing coverts. Flight feathers and tail are dark brown to blackish. Neck is mainly blackish with white down forming small white spots. We can see a whitish ruff at the neck base. The underparts are sandy-brown with broad paler stripes. In flight, we can see a conspicuous broad black trailing edge. The elongated head is brownish with white down on crown and nape, as on neck. Bill is slender and pale yellow. Eyes are brown. Legs and feet are blackish-brown. The race “G.i. tenuirostris” is darker overall and larger. Dark brown head and neck lack white down. Bill shows pale culmen. Long-billed Vulture is Critically Endangered since declines occurred in the early 1990s. 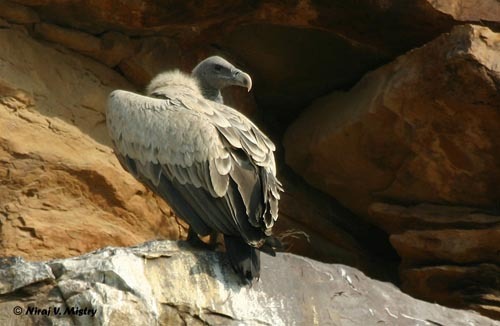 Vultures are vulnerable to poisoning by Diclofenac, used in southern Asia as livestock treatment. This drug is toxic to vultures when they feed on contaminated carcasses. The species is now locally extinct in several regions. Conservation and protection measures are already in progress, and the governments of Pakistan and Nepal are going to join India in order to stop the veterinary use of this drug (Birdlife International). Long-billed Vulture is rather silent, but when feeding, they produce some raucous sounds, grunts and hisses, mainly around carcasses. Long-billed Vulture frequents open country, and it is often seen near villages and towns, and in parks. The race “indicus” frequents mainly plains and nests on cliffs. 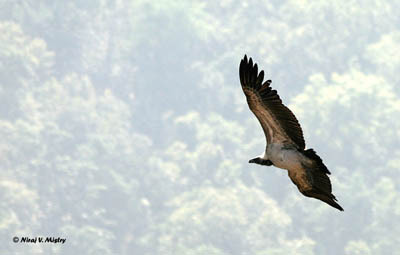 The race “tenuirostris” frequents foothills in the Himalayas, and nests in trees. 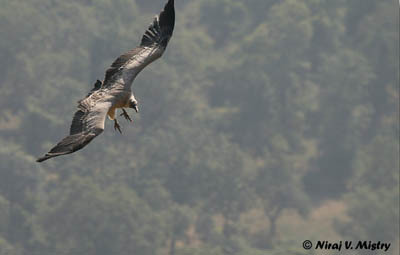 Long-billed Vulture race “indicus” is found in SE Pakistan and India south of the Ganges River, except extreme South. Long-billed Vulture feeds exclusively on carrion, and mainly remains of cattle. 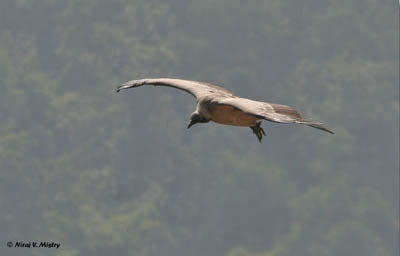 It often feeds close to other vultures’ species, and particularly Gyps bengalensis. Carcasses are located thanks to their keen eyesight, but they also detect other scavengers in flight or already feeding on the ground. When one of them flies down to the carcass, usually all the birds follow and gather in short time. They often move in groups. We can hear some grunts and hisses between them around the carrion. The vultures tend to gorge themselves. Then, they rest for long period. Long-billed Vulture is sedentary in its range. It performs some movements for food of up to 100 km per day. Flight displays are poorly known, but as in other “Gyps” vultures’ species, both mates soar close to each other in thermals, probably using the “flight in tandem”. Long-billed Vulture soars in thermals effortlessly thanks to the long, broad, rectangular wings. Breeding season occurs from November to March. Long-billed Vulture breeds in colonies. The race “indicus” breeds on cliffs. The nest is a loose platform made with sticks. Interior is lined with straw. There is a fun fact: usually, the nest is destroyed little by little by the chick. Sticks are pushed off the ledge! The race “tenuirostris” nests in trees. The nest is compact and built at about 7-15 metres up in large leafy tree. This race may nest in small group or loose colony, and very often near habitations or villages. Female lays one single whitish egg. Incubation lasts at least 45 days (between 42 and 60 days in most of vultures’ species). Both adults share the nesting duties. The chick is covered in yellowish-brown down. The nesting period lasts about three months. Long-billed Vulture feeds exclusively on carrion, and mainly the remains of cattle.